The Paris Agreement entered into force in November 2016. For the first time, 196 parties have agreed on limiting global warming caused by greenhouse gases to "well below 2°C" above pre-industrial levels by the end of the century. Additionally, efforts to limit the temperature increase to 1.5°C above pre-industrial levels should be pursued. The aim is to significantly reduce the risks and impacts of climate change (Paris Agreement, article 2). Scientists at the Max Planck Institute for Meteorology have recently published three publications examining different scenarios within these two targets. The publications study Artic sea ice, internal variability in European summer temperatures and climatic effects of changing the land surface. The two-degree target is a value where it is assumed that global damage to ecosystems and food production can still be reduced. As a result of the Paris Agreement, the Intergovernmental Panel on Climate Change (IPCC) was invited to provide a special report on scenarios for a 1.5°C target by autumn 2018 in order to examine whether, and how, this target could still be achieved. Scientists already agree that the risks and effects of global warming at 1.5 °C are considerably lower than at 2 °C. If Earth warms on average more than these two degrees, drastic and irreversible environmental changes will be the result. Arctic sea ice has been declining rapidly in the past few decades, with the strongest decrease observed during late summer. As the observed loss of sea ice is tightly coupled to increasing global-mean air temperature and thus to cumulative anthropogenic CO2 emissions, the loss of sea ice can only be stopped if global warming is limited below a certain threshold. Dr. Laura Niederdrenk and Dr. Dirk Notz examine the future evolution of Arctic sea ice under low warming scenarios in their paper . They find that depending on the observational dataset used to estimate the future evolution of sea ice, the Arctic Ocean will be ice free for most summers once temperatures exceed a threshold between 1.7 °C and 2.2 °C. The main source of uncertainty for this threshold stems from observational uncertainty in both the estimate of the global warming and of the sea ice area. This uncertainty is dominating over additional uncertainty arising from internal variability. Fig. 1: Likelihood of sea ice coverage for speciﬁc warming levels as estimated from the Max Planck Institute Grand Ensemble. For each warming level, the authors extracted all years (n) from the simulations that have a global-mean temperature of ±0.05°C around that warming level. The ﬁgure shows for each warming level for March and September the fraction of these selected years that have a sea ice concentration of more than 15% in any given grid cell. The authors are the first to combine an observational constraint linear relationship between global-mean temperature and Arctic sea ice area with a large ensemble of climate model simulations to estimate the future evolution of Arctic sea ice. For this purpose, the authors used the 100-member Max Planck Institute Grand Ensemble (MPI-GE), a unique experiment featuring a hundred potential Earths: Hundred model runs of the same coupled climate model start from different times of a pre-industrial control run but are driven by the exact same external forcings. This approach provides unambiguous characterisations of the simulated internal variability in a changing climate without being confounded by different model configurations. Dr. Niederdrenk and Dr. Notz are also the first to point to the substantial observational uncertainty, and the first to give a likelihood distribution for the future distribution of Arctic sea ice in all months of the year. All other studies on Arctic sea ice in low warming rates only examine the evolution of summer sea ice. They find that for Arctic sea ice, it really matters whether global warming is limited to 1.5 °C or 2.0 °C: Chances of a complete ice loss during summer are substantially increased for 2.0 °C global warming. "This is important as sea ice is possibly the only factor in the climate system where this difference in warming is not only a gradual difference, but might decide between existence and non-existence," says Dr. Laura Niederdrenk. In their paper , Laura Suarez-Gutierrez, Dr. Chao Li, Dr. Wolfgang Müller and Prof. Jochem Marotzke examine to what extent extreme European summer temperatures at 2°C of global warming could be avoided in a 1.5 °C warmer world. In other words, they examine to what extent extreme European summer temperatures could be controlled by limiting global warming to the global-mean temperature limits of the Paris Agreement. To evaluate the controllability of European summer temperatures with global-mean temperature limits, it is necessary to robustly characterize the irreducible uncertainty that arises from chaotic internal variability. Hence the authors used the 100-member Max Planck Institute Grand Ensemble. The paper offers a new perspective, because it does not only focus on the differences between the average climates under 1.5°C and 2°C of global warming, but rather on evaluating the full spectrum of possible European summer temperatures under both climate targets that arises through internal variability. Using the MPI-GE the authors sample the full range of irreducible uncertainty, and find that only 10% of the most extreme summer temperatures at 2°C could be avoided by limiting global warming to 1.5°C. However, although only 10% of the most extreme temperatures could be avoided, these events would correspond to the most extreme and severe heat waves, the ones with the most critical consequences. The authors also find that, due to the strong effect of internal variability, only 40% of the summer months at 1.5°C would have temperatures that could be distinguishable from those at 2°C of global warming. Fig. 2: European summer temperature anomalies in MPI-GE for different global warming levels. "To develop adaptation and mitigation strategies that are sufficient and successful, we need to understand the importance of the irreducible uncertainty introduced by internal variability, and the limited controllability that we have on extreme temperature events by setting global-mean temperature limits," says Laura Suarez-Gutierrez. The impacts of land-use have been shown to considerably influence regional climate. With the commitment to limit global warming to well below 2°C, emission reductions need to be ambitious and could involve major land‐use changes including the expansion of bioenergy and food crops, as well as afforestation. Together with other colleagues, Dr. Lena Boysen and Prof. Victor Brovkin compared changes in temperature extremes in response to alterations of the land surface . The scientists find that the choice of land-use scenario to achieve the 1.5°C target, e.g. focusing either on afforestation or bioenergy crop cultivation, may alter temperature extremes to a similar magnitude as induced by a 0.5°C warmer world alone - especially in the northern hemisphere (Fig. 3). Further research is needed to better understand how specific changes of the land surface properties cause changes in temperature extremes. Fig. 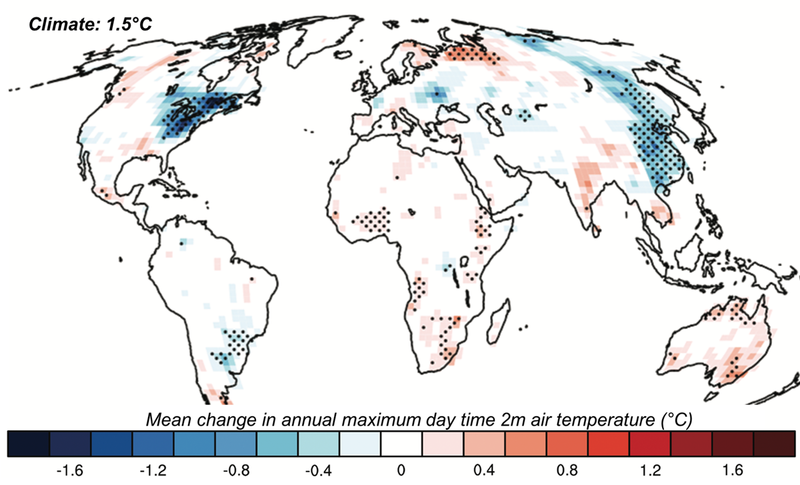 3: Mean change in annual maximum daytime 2m air temperature in response to land cover changes focusing either on afforestation versus focusing on bioenergy crop expansion as simulated by the Earth system model ECHAM6.3. The authors are the first to use two future land-use change scenarios specifically created for the 1.5°C target, namely variations of the RCP1.9. In order to assess the influence of land-use changes on local climate, they performed a multimodel experiment: Half a degree additional warming, prognosis, and projected impacts-land use scenario experiment (HAPPI-Land). "The increase in forest area in North America in one of the scenarios compared to extensive crop expansion in the other reduces the amplitude of temperature extremes in the Earth system model ECHAM6.3 substantially. This could be seen as a positive effect of afforestation," says Dr. Lena Boysen. The authors emphasize that biogeophysical climate effects of land-use changes are so far not accounted for in the process of scenario development focusing mainly on socio-economic assumptions and CO2 emission pathways. The authors furthermore identified that more idealized land-use Model Intercomparison Projects, like in the framework of the ongoing Land-Use Model Intercomparison Project (LUMIP), are vital to improve our understanding of biogeophysical effects of past and future land-use strategies.